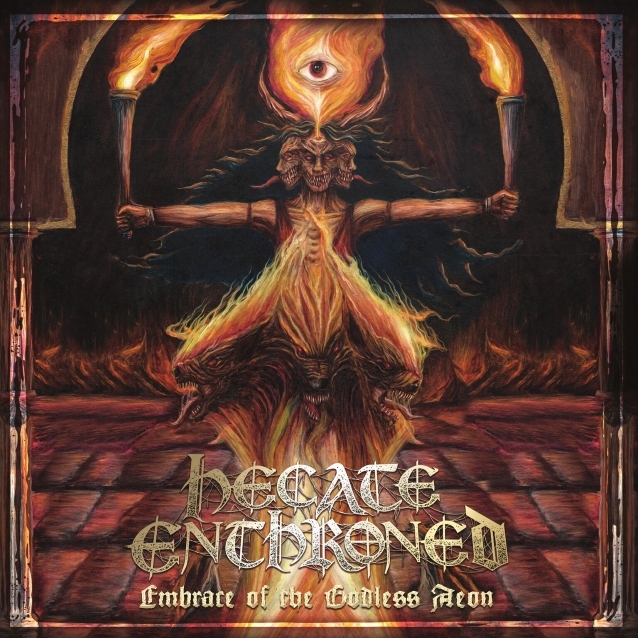 U.K.-based blackened death metal group HECATE ENTHRONED will release "Embrace Of The Godless Aeon", its first album in five years (and its debut for new label M-Theory Audio), on January 25, 2019. The LP — which features cover artwork by Nestor Avalos (BLOODBATH, ROTTING CHRIST, THE BLACK DAHLIA MURDER) — can be pre-ordered now on CD and red splatter vinyl at this location. A limited-edition deluxe box set that includes exclusive purple vinyl and cassette editions of the album, a signed photo card and other collectibles is also available. A new song from the album, "Temples That Breathe" will premiere on streaming and digital download platforms on December 7. A brief teaser clip can be seen below. One of the U.K. underground's longest-running and most respected acts, HECATE ENTHRONED has been praised by the likes of Terrorizer for its "mixture of death metal aggression with black metal atmosphere." "Embrace Of The Godless Aeon" — the band's first recording with vocalist Joe Stamps, who joined the band in 2015 — sees the group continue to deftly mix black with death, modern with classic and extreme with symphonic. 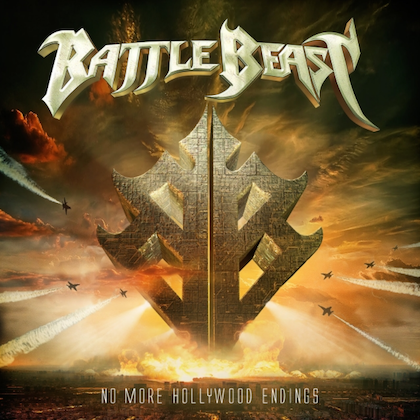 The album, which features guest vocals on three songs by Sarah Jezebel Deva (CRADLE OF FILTH, THERION, MORTIIS), was co-produced by Dan Abela (VOICES, THE ANTICHRIST IMPERIUM). Says bassist Dylan Hughes: "This album with its epic sweeping orchestration and heavy aggression represents a new chapter for us cementing the chemistry of the current lineup and our partnership with M-Theory. A welcome return from Sarah Jezebel Deva hints to the grandiose flavor of earlier releases, but this time, it's tempered with a guitar and drum sound forged from solid steel and then edged by a razor-sharp production from Dan Abela. The summoning of unholy flame and terror that is the cover art is an oil painting commissioned from in-demand satanic artist Nestor Avalos and begins your visceral journey through cold bleak landscapes, crushing tormented seas and searing shards of heavy metal." Originally co-founded in Wales by guitarist Nigel Dennen in the mid-1990s, HECATE ENTHRONED is dedicated to delivering their own brand of evil metal with little regard to politics or the trends of popular demand. 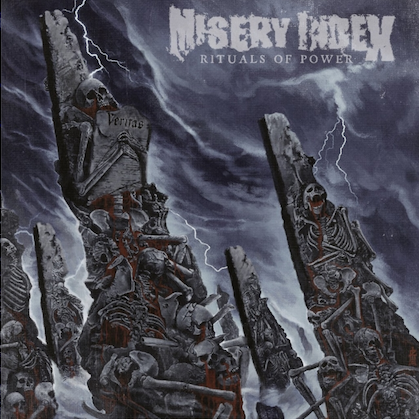 The group's 1997 debut, the Andy Sneap-produced "The Slaughter Of Innocence, A Requiem For The Mighty" (Blackend Records), was a seminal release in the then-burgeoning orchestral black metal movement. Since then, several full-lengths and EPs and numerous live performances have firmly established the band as one of extreme metal's most important voices, a sentiment that "Embrace Of The Godless Aeon" firmly reinforces. HECATE ENTHRONED's next live performance will take place on December 1 at the Tabernacl Chapel in Llandundo, North Wales, followed by a show in Belgium on December 14 with Altar at De Verlichte Geest in Roeselare. The group plans to tour extensively throughout 2019.